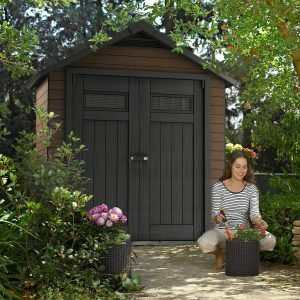 Lifetime outdoor storage sheds exhibit an appealing presence, molded to create a stylish semblance of horizontal wood panelling expressed through a desert-sand shade, attractively designed to enhance any garden location. These 7 x 4 ½ feet dimensions enable situating in rather confined regions, like positioning in narrow areas or stood backed-up against a house wall. The slender width delivers an inconspicuous feature providing mini proportions to fashionably spruce up any patio meanwhile serving seating and accessory storage. Weather-resistance regarded our key objective in supplanting conventional wood. Determined to derail previous upkeep hassles we ditched the varnish and substituted wood for resin creating one heck of a diversion regarding turning upkeep-maintenance frustrations into a fun hose-down, epitomising the ease of today’s contemporary designs. 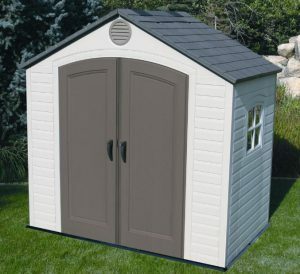 These 7 x 4 ½ feet dimensions are part of Lifetime’s exclusive 7 ft width range where only two sheds complete the group, the larger model delivering an area stretching 7 x 7 feet. Described as stronger therefore more heavy duty in comparison to their global best selling 8 ft width group, a shorter roof span enhances reinforcements further, able to support one heck of a pile of snowfall. Lifetime valiantly express a distinct sales pitch proclaiming their High Density Polyethylene makeup exceeds the competition’s in terms of weather-resistance, robustness and durability. Granted, this is quite a bold statement to make considering the recent varieties of new designs enrolling onto the marketplace however waves of optimism are expressed through feedback from those who have prepared the correct foundations. Lifetime’s composition & construction appears to excel in terms of quality. 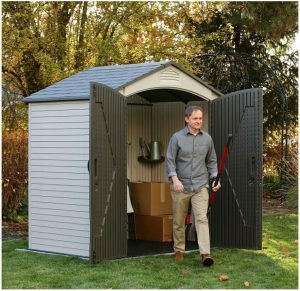 Shed Ranges displays a wide assortment of easygoing resin sheds which are starting to intensify the market with ‘Ultra Low-Maintenance’ headlining their description. 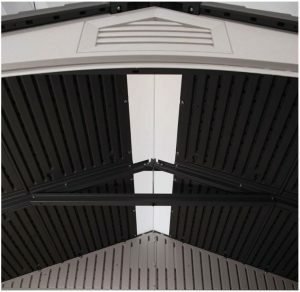 Manufacturing High Density Polyethylene (HDPE) into robust constructions regards Lifetime’s procedure, where a dual walled lining of panels embody the shed’s makeup. Constructed in sheet form they secure to the internal framework with premium grade screws, simultaneously abut to the roofing structure and floor’s interlocking perimeter edge. HDPE is 100% recyclable, an environmentally friendly plastic that refrains from seeping harmful chemicals into the earth. The molding procedure creates a ribbed effect internally delivering robustness to the outer-skin, withstanding knocks, dents and chips preventing their demise in appearance, a problem associated with single skinned makeups and the flimsiness of metal-sheet walls. The outside surface is molded to resemble a wooden construction displayed in horizontally-arranged panel formation, incorporating the intricacy of textured grain embossed throughout meanwhile enriched in the shade of desert-sand. 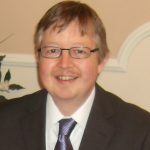 Weather-resistance is Lifetime’s benchmark, hence their name however polyethylene is not susceptible to deterioration derived through rot-attack. Unlike the repetitive conservation coats of nurturing varnish associated with wood preservation, polyethylene’s impervious composition remains free from decay when subject to damp & humidity. Surmounting plastic’s inability to withstand colour-fade and composition-splitting when under assault from sunburn, Lifetime incorporate UV protection into the mix to stabilise & toughen the manufacture for defence. Determining a fast procedure with regards to cleaning a resin facade usually relates to either a light pressure-wash or a shower down with the garden hosepipe for our concerns, delivering the most easygoing of cleaning duties. Okay, elbow grease is required to shift deep-seated grime that lodges within the textured-grain, nevertheless a nonabrasive brush and washing-up liquid dislodges in a flash. The key to avoid scratching the surface is to sidestep using harsh cleaners. Lifetime design their roof structures into the well-favoured apex construction. The high angled pitch up to the roof ridge delivers the advantages of an effectual prompt drainage system putting an end to puddles evolving owing to the steepness meanwhile reciprocating with an abundance of internal ceiling height. In-excess of 2 metres delivers ample headroom for a grown-up to comfortably wander around inside without getting bent-over backache. A double lined skin of impervious High Density Polyethylene ensures a capping of weatherproof robustness without succumbing to replacements through a demise in structural format when damp conditions strike, the complete opposite effect in contrast to roofing felt’s inability to provide long-term weather defence. An ultra stylish molding procedure creates a semblance of conventional slate roof tiling. Incorporated into the central roof ridge lies a full length translucent skylight manufactured from polycarbonate to bask daylight inside whilst ensuring no rainfall finds entry where the walls adjoin, the roof forms eaves by overlapping the facade. 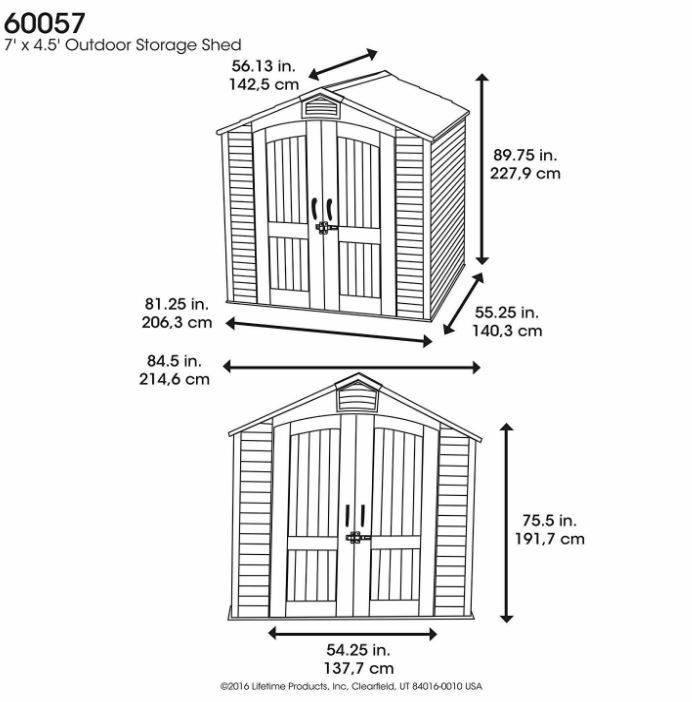 Where snowfall is concerned, the shorter size of these 7 ft width sheds deliver more strength compared to the 8 ft width range according to Lifetime. Additionally reinforcing the roof, secured to the infrastructure stations a central steel truss system stretching out across the internal rafters bracing a backbone of support to improve stability for accommodating hefty lumps of snow. Included with this 7 x 4.5 ft model regards two corner shelves and one long 30″ x 10″ shelf that secure to the steel infrastructure delivering a robust fixing however their size is rather limited to what storage they can accommodate. We embraced a popular tip by installing a row of stand-alone shelving to one side of our shed exploiting the internal loftiness with tiered accommodation for weighty gardening stuff. Those large plastic stack-able boxes work great too, another popular solution. 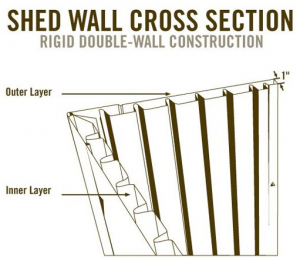 This 4 ½ ft width is absent from windows in the facade as a result of its mini-depth however the lack of this feature does increase the facade’s overall strength and delivers more privacy to what’s inside, a desired style for many utility services. The skylight up-above instead delivers daylight illumination to the interior. Incorporated into the front and back situated above the doors lie two screened air-vents designed to prevent pests from crawling in. Generating a fresh air current to disperse the interior they stop the process of condensation building up inside during humid conditions meanwhile eliminating a clammy atmosphere evolving. We find these a great feature over in the UK for maintaining a fresh ambience. Lifetime integrate floors into all their sheds. Each sheet interlinks with the next making up the floor expanse whilst delivering enclosure they adjoin the facade by interlocking with the panels, a simple click-into-place design mechanism. Encasing a shed this way forestalls puddles emerging when rain showers down plus delivers a pure benefit when Autumn leaves fall. The floor makeup regards a chunky anti-slip polyethylene manufacture, stain resistant to solvent & oil spills whilst toughened to stand up to heavy duty tensions and the endurance stresses weighty lawnmowers deliver. Cleaning’s a breeze however it’s imperative these floors are laid on solid level ground for longevity to withstand these described pressures. Lifetime deliver superb access through their wide double doors, opening right out they enable effortless entry for lawn-mowing duties and transporting heavy machinery. Through-bolt latches stationed on the left door’s internal side assist the delivery of a closed position, one glides into a channel presented in the top architrave, the other slots into a hole within the resin base providing a stay-closed advantage in windy weather. 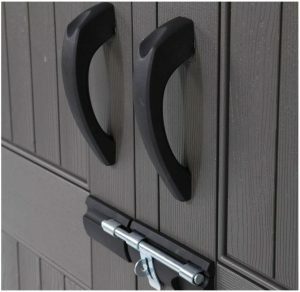 Lifetime doors manufacture is similar to the facade’s weather-resistant polyethylene twinned lining however steel reinforcements enhance security measures, increase rigidity to their operation whilst determining proper fixings to the door’s hardware. Rather than individual hinges, full length steel hinge pins operate the doors swing whilst a through-bolt containing a padlock clasp ensures closure and provides security. The pivotal requirement for this shed’s assembly relates to preparing a solid levelled flat surface for the shed to lay. A level substrate of wood, concrete or paving slabs provide the fundamental first step in accomplishing a precise construction. Those who adhere usually provide wondrous feedback. Laying the shed’s base on solid flat footings ensure the floor serves the tensions of severe stresses whilst solidity laid below enables firm anchorage to the ground can be attained. A vertical upright stance is derived from a level base: imperative to ensure the roof weight delivers equal force on all four sides, enables a speedy assembly by delivering a quick plumb alignment whilst assuring the doors precise operational swing. Once the correct foundations are in situ, you’re rolling. The self-assembly procedure requires two people to work through each illustrated step in the instructions implementing the demonstrated procedure. 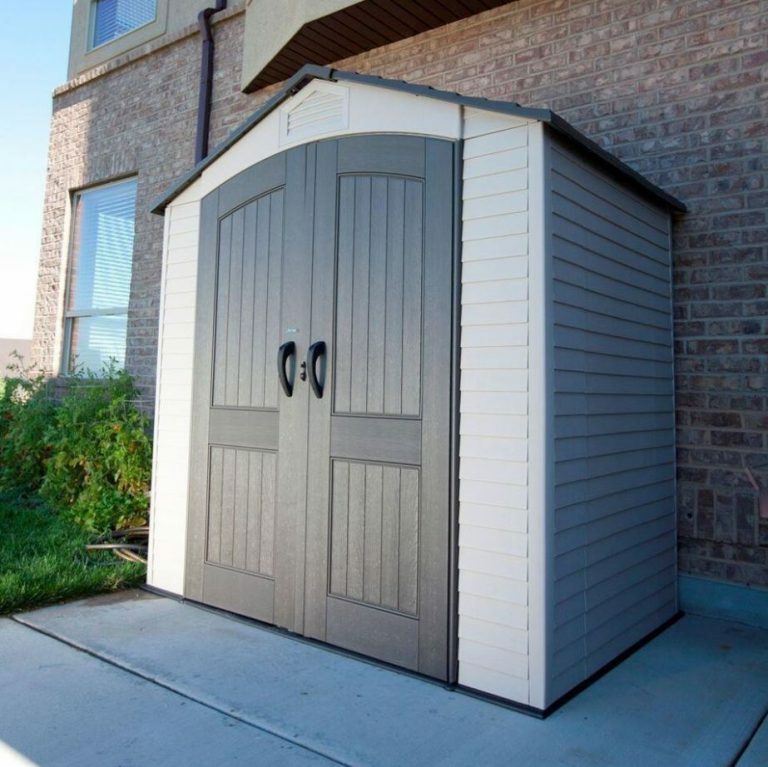 Shed Sizes presents a variety of low-maintenance storage solutions arranged in size-order, similar to this manufacture yet exhibiting alternative appearances. Lifetime deliver a storage solution able to accommodate confined garden areas with this 7 x 4.5 ft facility. Weather-resistance, sturdy build quality enhanced with a modish spotless presence that’s a doddle to maintain appearances regard Lifetime’s design objectives. Impeccable feedback trumpets through reviews regarding this durable low-maintenance composition coupled with 10 years of warranty protection sparks attention. A well favoured garden shed for those wishing to escape conservation headaches, worthy of a full inspection. 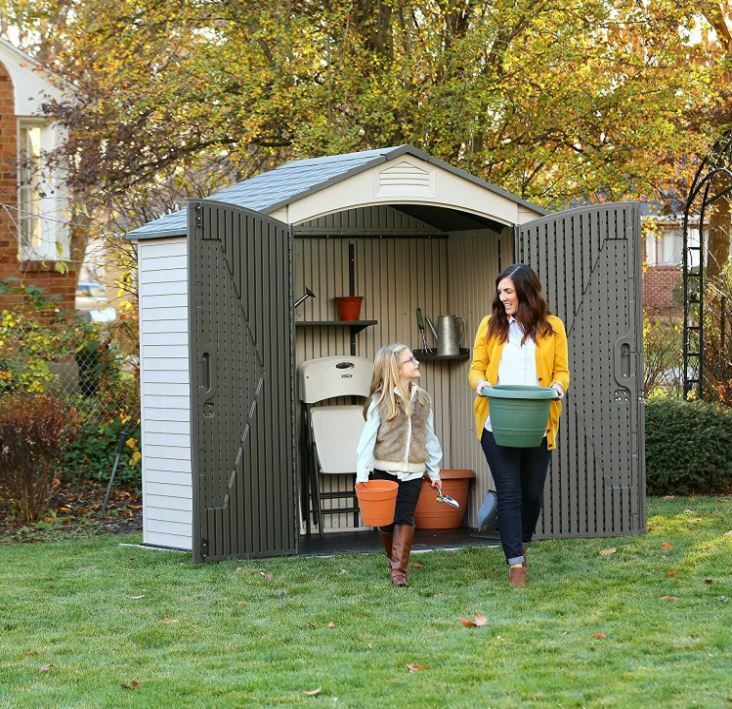 I appreciate your time reading about Lifetime’s small plastic garden sheds. 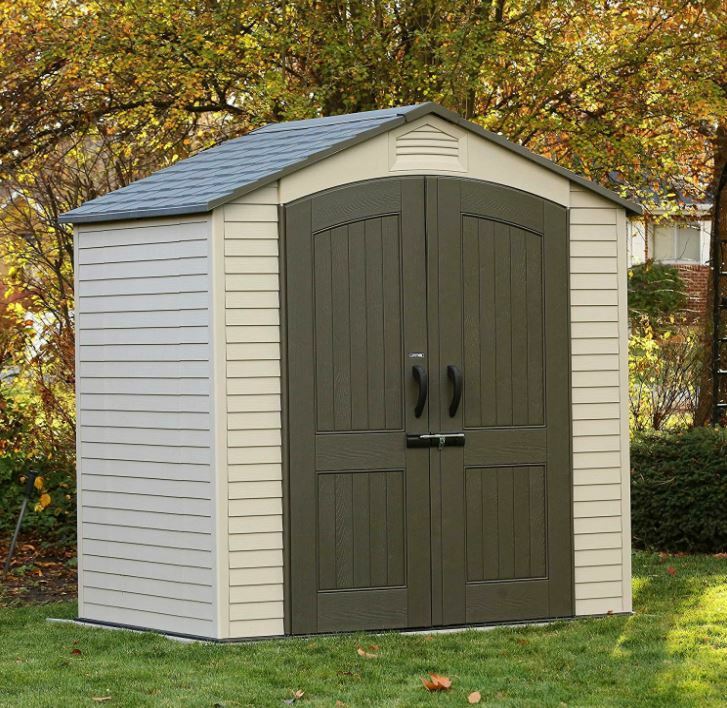 Please share your favourite small-shed designs in the comment section below. Please share Lifetime’s small shed. Thank you! I appreciate your time visiting to read about Lifetimes small outdoor plastic sheds. 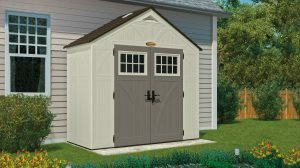 Lifetime recommend situating all their sheds on a solid substrate of either wood, asphalt, concrete or paving to attain solid groundings, particularly important in assuring firm anchorage in addition to ensuring the floor copes with surviving demanding stresses long term. Coinciding with solidity is ensuring that the foundations are laid perfectly level to accomplish a perpendicular construction. A true vertical stance delivers ease of assembly due to all the panels aligning at ease, the doors to swing correctly and to avoid a skewiff stance, derived from the roof weight applying equal pressure to all sides. The problem with gravel is that it’s not perfectly flat or level which would affect the flooring nor would you be able to accomplish firm anchorage. 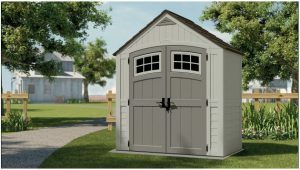 These sheds are not susceptible to weather-decay, this is what the warranty covers plus it’s essential the correct foundations as described are laid for the shed to stand vertical to ensure the construction can survive long-term. I would imagine not to adhere to the foundation rules would void the contract somewhat. This is really cool. I have a lot of land and open space in my backyard. So I’ve been looking for a shed to place my tools and dirt bikes in. The only thing is that, there are so many to choose from and it’s difficult to make the right decision. So this was exactly what I was looking for, you just made my search 10x more easier. What shed do recommend most? Great review, definitely going to bookmark this page. 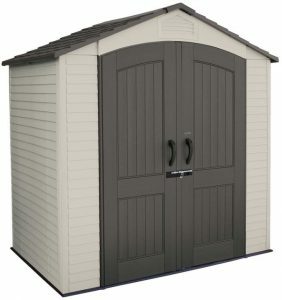 Thanks for dropping by to read about these quality plastic sheds, manufactured by Lifetime. 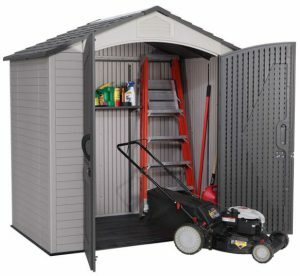 To accommodate dirt bike and tools including gardening gear etc, sounds like you may be looking for larger dimensions than Lifetime’s 7 x 4 ft shed. 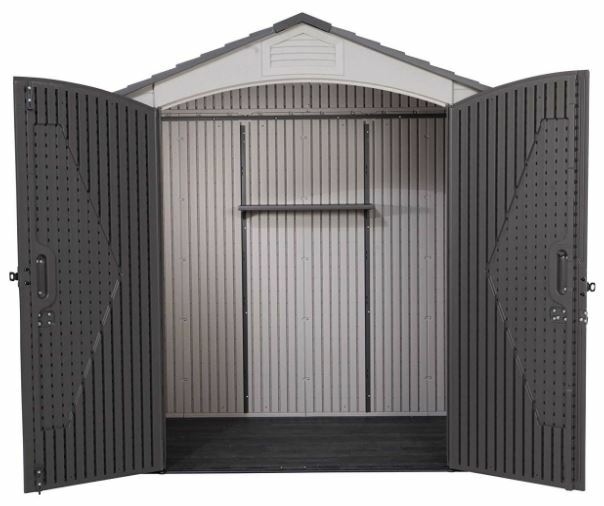 Shed Ranges regards a visual page of all quality low-maintenance resin sheds reviewed on this website including those with larger dimensions. Lifetime will take some beating due to their High Density Polyethylene composition secured around a steel framework if you are searching for a more heavy-duty build. Lifetime are probably the manufacturer boasting the largest sales, albeit Keter’s Factor sheds also have Global sales due to their more budget design which maybe of interest. Suncast Tremont & Grosfillex are all well established low-maintenance designs whilst the composite wood/plastic Fusions & customizable Oakland sheds are new entrants however they all display super stylish facades and are secured around a steel infrastructure for stability purposes, yet all boast low maintenance.